This is it - the one third of the kitchen stuff that has been eliminated. It includes 19 bowls, 15 plates, 9 pots and pans, 4 glass storage containers, 9 plastic storage containers, 55 cookie cutters, 21 glasses and 22 kitchen gadgets. Most of this will be donated to Good Will. Some, which we inherited, will be offered to other family members before donation. And a couple things like decent knives and microwavable plates are going to my work where they will be added to our lacking communal kitchenette. Getting rid of one third of the kitchen stuff was a lot of work. With Jeff's help it took about three hours yesterday. Now some of the stuff that was up on our soffits fits in the cabinets. Our kitchen looks much less cluttered. I have the itch to keep eliminating so I can fit the last couple things inside the cabinets. It's been weird working in the kitchen today, although, I haven't missed anything yet. The biggest change is our random drawer of kitchen implements which holds the carrot peeler, knives, bottle opener and such has a lot more space. I was surprised to find several things in the kitchen that just didn't belong there like a hammer and pinking shears. Those items have been relocated. We eliminated many plates and bowls that I had accumulated for food photography for my recipe blog. I do have one set of china I inherited from my grandma that serves eight which we kept. For everyday use we kept a set of four place settings. Including four wine glasses and goblets, if we ever have more than four people over they can drink out of regular glasses or ball jars or something. (We don't do disposable.) It will be fine. 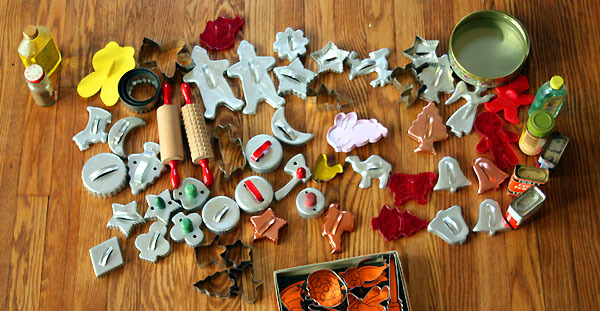 These are all my cookie cutters before. I pretty much kept all of them from any relatives. The thing is I only make sugar cookies at Christmas. I pared it down to just the cookie cutters I remembered from childhood. I had 69 and now have just the 14 shown below. There were several items which Jeff really wanted to keep. He has veto power and so they stayed. It wasn't that big of deal, we just got rid of other stuff and still managed to get rid of 1/3 of the items in every category. And in some categories like plates, and cookie cutters we got rid of significantly more. Interestingly we wound up with a list of things we wanted for the kitchen. Things we either don't have or we have a damaged version. This included a non-aluminum pie pan, large sauce pan or deep skillet, stock pot (with pasta insert) and better tongs. The overall goal is to reduce what we own, but a wonderful side effect of this evaluation is we are able to identify what we'd like to improve; allowing us to increase the over all quantity of what we have as well. Now we aren't going to run out and buy all these new things. We will look at our finances and decided when we are willing to invest. We'll forgo buying other things to have the money for these items. Plus one of my goals is to only buy five non-essentials until after the New Year. So I need to consider very carefully what these things will be. It is also possible that with some research I'll be able to find second hand items that will work. What things do you have in your house that you would like to upgrade? How are you going to go about getting these upgrades? don't ever leave me in a kitchenware or shoe store, or i go nuts. i suppose it's time to sort mine out as well. thanks for the reminder! You inspired my husband and I. We spent the day today cleaning out our closets, book shelves and drawers in our daughter's room. We still have a ways to go but I think we had a great start. I see a cast-iron skillet in the pile of stuff to go. :'-( I got rid of mine once and regretted it (of course, that decision was part of a string of regrets). I could (and should) clear out a lot from the rest of the house but I would find the kitchen very difficult to cull. Good for you! 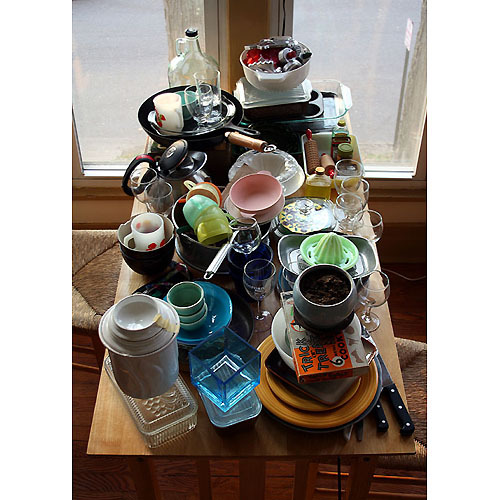 I told my husband, 10 years ago, to shoot me if he notices that I start to hoard things in the kitchen or elsewhere. Almost a month ago I wrote the post(http://lakakuharica.blogspot.com/2010/10/gdje-si-bila-nigdje-sto-si-radila-nista.html) about just such thing: cleaning the clutter in cupboards, pantry, bathroom and drawers and closets. I see lots of items in that must go pile I could use! We are a household with the bare minimums and it makes for such a more peaceful environment. Less clutter in the house = less clutter running through my mind. Good for you! We are upgrading our small bathroom right now, what I found is that I can be a product junkie when it comes to make-up, moisturizers and nail polish. I counted 15 bottles of nail polish when I was getting everything out of the bathroom last night and my husband said "I have never seen your nails in any of these colors". I guess when we are putting everything back in the bathroom, I will be switching to multi-purpose products. I did the kitchen declutter and then sold it all for $100 bucks to someone who just moved. I've given a ton to Salvation Army but I was getting rid of full set of kitchen stuff and including all dishes. I had an extra 12 wine glasses and 8 water glasses. It was insane to have that much stuff when I live alone. I like your blog. Scary, but I recognized a lot of the cookie cutters as I have some too. Good on You!! You are actually doing what I have only been thinking of doing for a long time now! I do wonder though if I got rid of a third of my kitchen stuff what would I use to shoot my food with/on? Just wondering how you intend dealing with shooting food. I have recently thought that I actually need to get MORE props for my food photography. Oh wow, what an achievement. I have a million kitchen implements which remain unused, and a utensil drawer from hell (the type where the back and base have started to dislodge theselves from the rest of the drawer frame!) - I really need to follow your lead. I'm always frightened of letting things go, but I really only use the same favourite items over and over. Oh my gosh, how liberating! You have really inspired me! I know there's so much stuff crammed into cupboards that I never use, and I am going to follow your lead. Love it! Brandon and I have been cleaning (and clearing) out our items since we've moved back, and have so far taken about 250 cubic feet worth of stuff to Goodwill.. the back of my car is still full of a giant pile as well.. and as I look around the house, I notice little things here and there that I just don't need. It is great to just be surrounded by things that you really love- and that can put a smile on your face. I am in the process of moving for my student teaching and am slowly going through sections of my house and getting rid of stuff. Having to move my things or put them in storage really makes me think about what I really need. I recently bought an apartment thats 400 sq feet smaller than the one I live in now. I'm going to have to go through a clean up process like this soon. I'm a little scared, but it's good to know it can be done! Just my two cents of suggestions. You get the happy fuzzy feelings of helping people who desparately need it in these hard times - and get to reclaim some of your kitchen space.